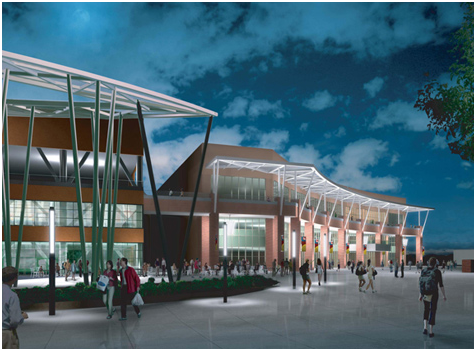 Full engineering design services to the California State University, Los Angeles for a new student union. The design-build project consisted of a new four-story steel building above subterranean level. The structure is designed for compliance with 2001 edition of California Building Code. Special moment resisting Frame system with side plate connections have been used to resist seismic and wind loads. The facility features include: a 200-seat theater, lecture halls, bookstore, conference rooms, an auditorium, food service/dining areas, and a fitness center. The new facility will connect to the existing Golden Eagle Building and the Luckman theater complex to be the central focus of student activities on campus. In 2009, the Student Union received the DBIA Merit Award for the design-build construction of a public sector building.